Welcome to Omaha and the Aksarben Stock Show and Rodeo. You’ll be busy watching some of the best cowboys battle for greatness in the world’s toughest rodeo, but we encourage you to explore Omaha. Delicious and exciting adventures await throughout the city. Browse below for just a sample of things to do during your wild weekend in Omaha. 1. New at the World&apos;s Best Zoo - Visit this animal lover’s paradise. In between trips through the world’s largest indoor desert and America’s largest indoor rainforest, explore the African Grasslands at Omaha’s Henry Doorly Zoo and Aquarium. Take in 28-acres of breathtaking panoramic views and long vistas teeming with African wildlife. Then check out the Alaskan Adventures exhibit before it closes for the season. Where more than 70 enormous bronze sculptures of giant humpback whales, sea lions and orcas create a splash ground like no other. 2. Omaha Craft Brew Tour - We invite you to meet our makers. Omaha’s craft brew scene is one of the most buzzed about in the beer world. Taste what everyone is talking about, and create your own tour of Omaha’s craft breweries. Go to www.OmahaCraftBrew.com on your mobile device to plan your route. Cheers! 3. Welcome to Beef Country - Every trip to Omaha comes with the promise of a juicy steak. Omaha’s legendary steakhouses will keep your carnivorous cravings at bay as you start your steak pilgrimage here. Whether you want flame-broiled, whiskey-doused or wood fire-grilled – Omaha’s got you covered! 4. Shop, Eat, Drink, Repeat - A short walk from CenturyLink Center Omaha, the Old Market Entertainment District is buzzing with history and entertainment. Listen to the sounds from street musicians while strolling cobblestone streets lined with shops, pubs, and distinctive Omaha restaurants. 5. Meet Bob! - He&apos;s Omaha’s most eligible bachelor and invites women to walk all over him! Actually... Bob is Omaha&apos;s tweeting, Instagramming, one-of-a-kind pedestrian bridge connected to more than 150 miles of trails. Chat with Bob at @BobTBridge. 6. Get the Meat Sweats and Go Home Victorious - Give your inner athlete a true workout when you take on the mother of all beef challenges. Throw out the calorie counting and bite into the Stellanator – a massive meat mountain weighing in at 4.5lbs. and 4,900 calories. Few have finished the burger piled high with every possible burger topping (seriously…more people have been to the moon)! 7. Visit All 15 Giant Blue Push Pins - We’ve made it easy for visitors to find the fun in Omaha by “marking” 15 top Omaha attractions with giant blue push pins. These attractions each offer year-round, unique experiences that appeal to a wide range of interests. Download the pin map and visit all 15 locations..
8. Taste the Original - Try the Reuben Sandwich in the city it was created. Yes, it was invented in Omaha – we don’t care what those New Yorkers say. Reuben hot spots are sprinkled throughout the city, so pull up a seat and dig in! 9. National Alpaca Farm Weekend - The rodeo lands on National Alpaca Farm Weekend, so it is a great time to visit with these sweet tempered animals. Visitors can stroll through the pastures and feed the alpacas (yep, they will eat right out of your hand)! Meet 30 alpacas and enjoy fun photo opps. 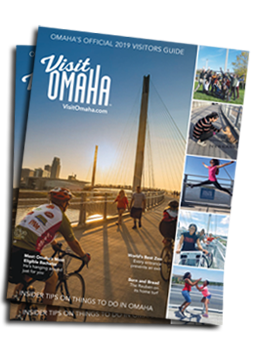 There&apos;s a lot more to see and do in Omaha! Check out other things to do in Omaha and find Omaha events happening during the Aksarben Stock Show and Rodeo.